His Excellency Lyonpo Loknath Sharma is on a five-day visit to Hydropower Projects. On the first day, Lyonpo visited Mangdechhu Hydropower Project in Trongsa. The program included visit to the dam site, surge shaft and Adit V. Further, he is scheduled to visit the power house. Mangdechhu Hydropower Project is scheduled to commission by end of December 2018. Lyonpo expressed his appreciations for the persistent hard work put in by the Project Management. However, Lyonpo said that the last-minute rush to complete and hand-over the project should not compromise the hard-work put in since the inception of the project to till date. He further expressed that the Authority should share the experiences gained and lessons learnt by constructing the project so that future projects benefit from the experiences and avoid similar issues, if any. In the next four days, Lyonpo will visit Nikachhu Hydropower Project, Punatsangchhu Hydropower Project I, and II. 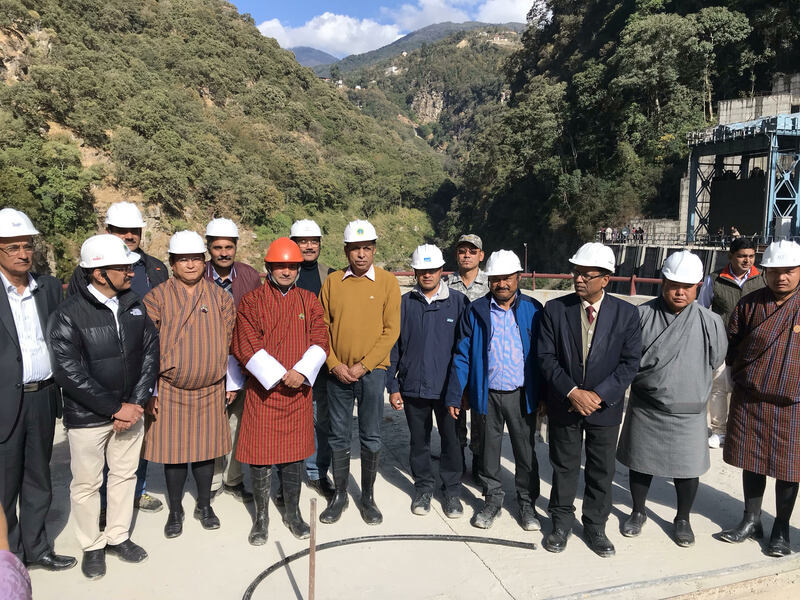 Lyonpo is the Chairman of the Hydropower Projects and his first ever visit to the hydropower project after joining the Ministry of Economic Affairs.